It’s been eight years and it’s finally here. 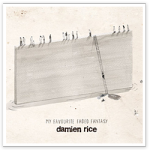 Damien’s third studio album, My Favourite Faded Fantasy, produced by Rick Rubin and Damien, is available to pre-order now through damienrice.com, iTunes and Amazon. My Favourite Faded Fantasy will be released on .